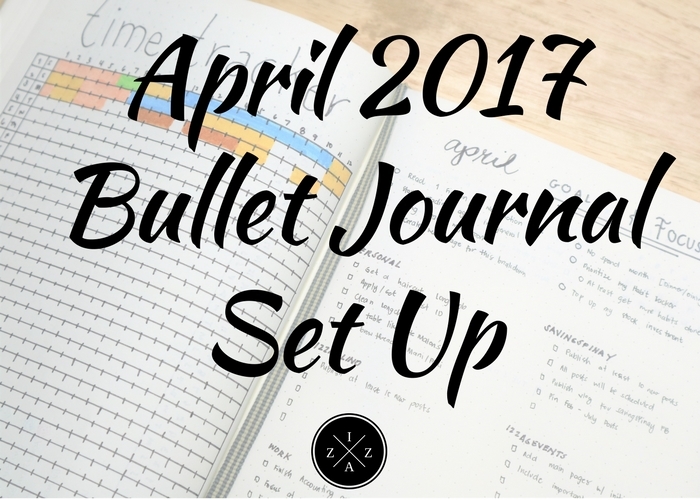 I am so thrilled to share to you my April 2017 Bullet Journal Set Up because I am currently using a special notebook. Since I've learned about Bullet Journaling there's only one notebook that I am longing to use --- Leuchtturm1917. This notebook is widely used in the Bullet Journal community and almost all of my favorite Bullet Journalists use it. For two years I tried my hardest to find the notebook here in Manila. I checked National Bookstore a couple of times but failed to find a A5 Dotted. Surprisingly last February in a Friday after work stroll at National Bookstore Glorietta Makati I found the Leuchtturm1917 notebook that I want. I immediately bought and was in total cloud nine the whole weekend. I was supposed to do a March 2017 Bullet Journal Set Up but obviously I failed to publish any post last month. And so to make it up to you all, I will be sharing a quick overview of my Bullet Journal Set Up in March and of course a sneak peak with my April 2017. One things for sure the vertical calendar layout works for me best. I enjoy seeing all my appointments, my events and gratitude log on the same page. To spice things up I did change the color of pen I use for my gratitude to green. This turned out to be a good decision because I am literally in love with the set up. As for the Habit Tracker it is obvious from the photo that I lack the discipline to commit to my habits. I only aced the morning skincare routine and updating of my Bullet Journal. I also included a self-care tracker whether I felt productive, happy, excited or depressed. For Goals and Focus I did a simple list on what I want to accomplishment by the end of March. Also unlike past months where I included a ton of goals, for March I just zeroed in to the important ones. 1. Read and finish at least two (2) books - FAILED. 2. Finish main pages of my event business website, www.izzagevents.com - FAILED. Will still need to make time for this. I plan to launch this site by May. 3. Publish new posts in SavingsPinay and IzzaGlino. DONE for SavingsPinay but major fail on IzzaGlino. I find it hard for March to squeeze blogging. 5. Do/Accomplish at least seven (7) days continuous habit and routine. FAILED. Need to focus on this more. I will do a separate blog post or maybe video for this. And since I've been using an extra pricey notebook I decided to be as intentional as possible in creating both my weekly and daily pages. I don't want to waste any page. I say this layout on Instagram and find it fitting to my liking. Combining both Weekly and Daily on one page might probably answer my long quest of planner peace regarding my Weekly Pages. I also decided to do the four weeks in advance just to save time and plan things in advance as well. I also did the vertical layout for April where I include all events, appointments and gratitude in one page. The April Habit Tracker is same with last month's only that I decided to fill up each box with a design rather than the usual. For Goals and Focus this April I included a number of personal goals to hit. I also included at least five goals for each blog I own. 5. Prioritize Habit Tracker or at least get more habits done compared to previous month. 6. Top up my stock investment. You can read the announcement of my stock investment here. Still same as last month, one spread per week. That's it for my March and April Bullet Journal Set Up. I hope you enjoyed this. Bilib din ako sa tyaga mo Miss. Izza. Ang ayos at ang ganda ng journal mo. Bihira na sa ngayon ang mahilig ng ganyan kasi yung iba sa cellphone apps na nakalagay ang journal at expenses nila. Thank you Ms. Grace. Naku mas bilib po ako sa inyo noh!!! Thanks po for reading my post.